Peggy Carter will appear in the first episode of Season 2 of Agents of SHIELD. It will be a flash back to the beginning of SHIELD. More over she will be joined with two of the howling commandos from the First Avenger film. 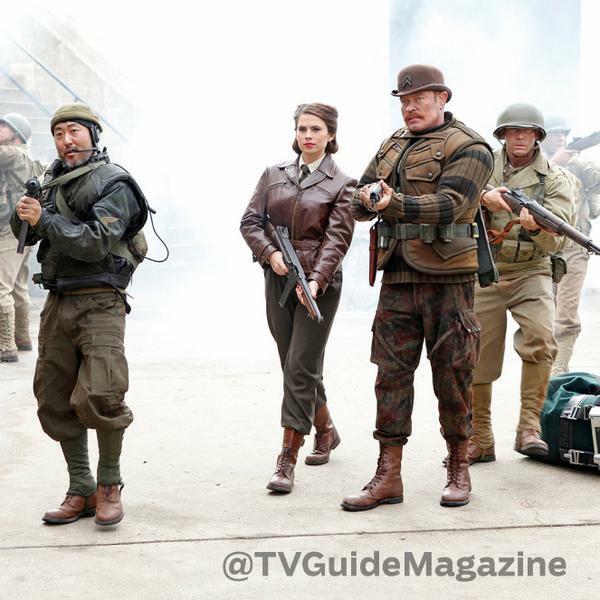 Dum Dum Dugan (Played Neal McDonough) and Jim Morita (Played by Kenneth Choi) will also both appear. This may help drive up some interest for Agent Carter that will begin after the first half of Season 2 of Agents of SHIELD is complete. 5 reasons to be excited for Agent Carter? "Shadows" - Coulson and his team are now wanted fugitives with limited resources--but that's not stopping them from keeping the world safe from powerful and unseen threats everywhere. However, with new members they hardly know, will S.H.I.E.L.D. ever be trusted again? Watch "Marvel's Agents of S.H.I.E.L.D.," on the ABC Television Network. We do not yet know who the villains or main focus will be of Agent Carter. With Hayley Atwell in it my guess is that it will do very well. I also really like the idea of it filling the gap between the two halves of Agents of SHIELD it helps keep the momentum for the show going.